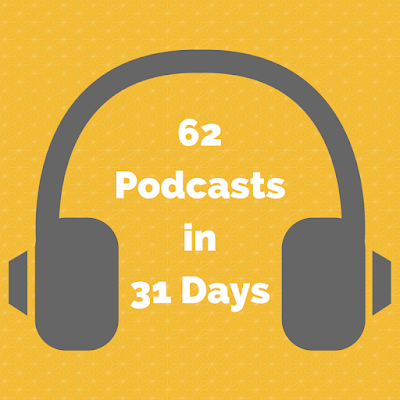 Well, I didn't make my goal of 62 podcasts. I got to 50, and ran out of month. But, I still think that's a decent chunk of listening. I found some gems, so clunkers, and some interesting ones I probably wouldn't have tried without the challenge, but I must admit, I'm relieved that I'm back to listening only for fun, and not scouring the interwebs for new listens. Here's a recap of the last batch. And that folks, is a wrap for my August podcast challenge. While I enjoyed it, it really did cut into my reading time. But, I definitely found plenty of listening material for my walks and housework tasks. And if you still haven't tried podcasts, what are you waiting for? Just click a link and listen to one. You can do it right from you phone or computer. It's better than television, and easier than holding a book. And if you have a favorite that I didn't listen to in August, please leave me the title in the comments and I'll check it out.